Memphis: It’s a city where Jerry Lawler reigned as King and tens of thousands routinely packed Mid-South Coliseum for professional wrestling. Thus, it’s only fitting Memphis’ postseason college football affair, the Liberty Bowl, would pay homage to the squared circle. Of course Memphis’ rich wrestling history played a part in Monday’s Liberty Bowl. Why else would graduated assistant Michael Richardson play the role of heel manager, providing outside interference clearly caught on camera but unseen by the officials? Surely Richardson was just emulating managerial legends like Jimmy Hart, Jim Cornette and Bobby “The Brain” Heenan when he took not one but two swipes at West Virginia players along the sidelines. Here, @TAMU. Need another? https://t.co/iLQ7hfD52o Coach Mike Richardson is the name being tossed around. Take some action. Fire this guy. When Texas A&M opens the 2015 season against Arizona State, Richardson should be suspended above the field in a shark-diving cage. Or, you know, fired from A&M’s staff, never to coach again. It would seem apparent Texas A&M was working heel, particularly given the Aggies’ 45-37 win was met with choruses of the single most heelish chant in college football today. S-E-C chant is loud and clear in Memphis from the Aggies. 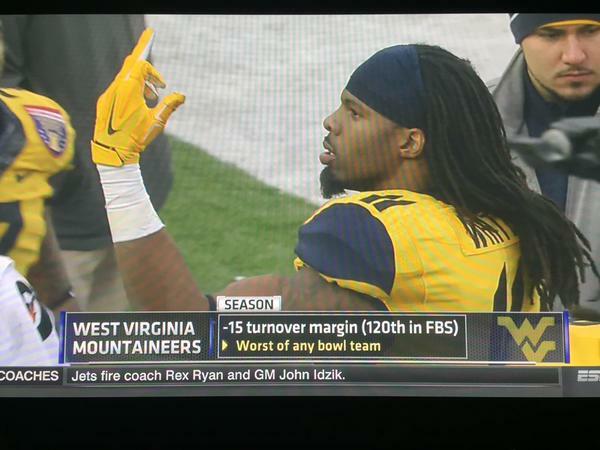 West Virginia wide receiver “Stone Cold” Kevin White was obviously working the edgy-face dynamic when he was caught on camera giving someone an Attitude Era salute. Some intrepid marketer is letting a real opportunity slip away if he/she does not produce foam middle fingers in blue-and-gold next season. As absurd as the sports entertainment displayed in Monday’s Liberty Bowl was, it failed to match the intensity of last week’s return of the classic War Games match in Miami. The Memphis Tigers may have been outside their territory, but they brought the heat to BYU in the inaugural Miami Beach Bowl. Pressure is on the organizers of this event to match the debut edition, but they can look to the Great American Bash for inspiration. The event marked the debut of War Games. When the concept was moved to September, the Bash was never quite the same. Then again, the 55-48, overtime win for Memphis pre-War Games is probably a better template for booking future Miami Beach Bowls than making War Games an annual tradition. Likewise, the Liberty Bowl would likely prefer being remembered for great football than for honoring Memphis’ wrestling roots.